When Magnify is fed data to be stored as search content, it expects an incoming document in a specific format. Using Format Magnify, the WebFOCUS protocol is transformed by the Reporting Server into a document following these protocols. Using DataMigrator, the document is manually created and must adhere to these protocols. In iWay, the IEI Feed Agent converts the process flow output to adhere to those protocols. The incoming feed document can contain one or more records or search results. 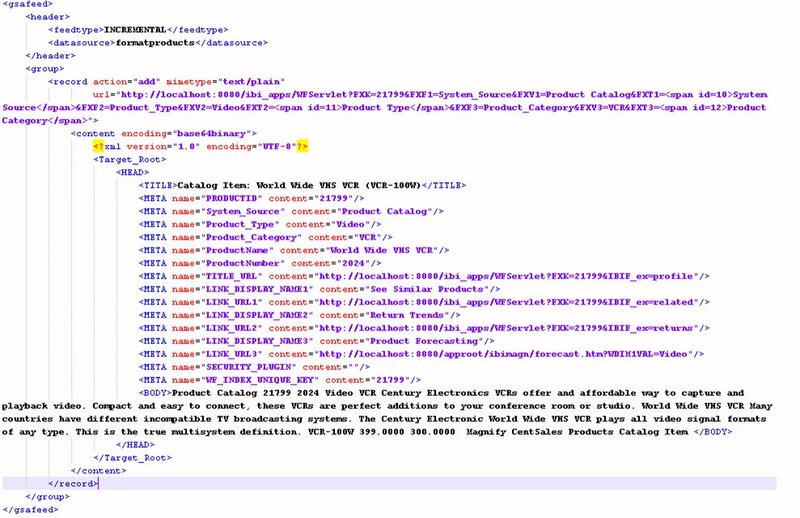 iWay Service Manager (iSM) and the FORMAT MAGNIFY command can be used to extract, transform, and load data into the Magnify index library from various sources, such as databases, legacy systems, and transactional messages. Each document generated must be well-formed XML that adheres to the Magnify feed protocol. 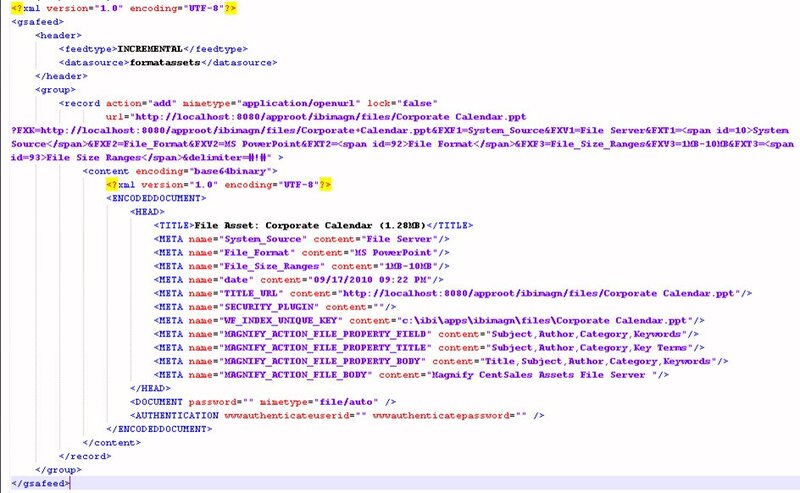 This section describes the required document format whether you are using the IEI Feed Agent in iSM or the FORMAT MAGNIFY command to feed data to Magnify. Note: The IEI Feed Agent and FORMAT MAGNIFY command generate the final document in adherence with the Magnify protocols. However, the developer must prepare the data in accordance with these protocols. The following image illustrates a well-formed XML document that adheres to the Magnify protocol specification. Each incoming feed document that is indexed by Magnify requires a header and record element. These elements provide information, such as how the document should be fed to the index library and the type of document that is being indexed. full adds all data to the index from the data source. If a record is repeated in the feed, it is duplicated in the Magnify index library. Therefore, the full feedtype is recommended only when there are no duplicate records. incremental updates an existing record in the index or adds the data as a new record. The record is first matched using the WF_INDEX_UNIQUE_KEY meta tag. Otherwise, the URL value is used. This mode prevents duplicate records from being added to the index library. Important: It is a best practice to always index data using WF_INDEX_UNIQUE_KEY. Is the source of the data to be fed to the search engine. If the library is not found, Magnify creates it dynamically. Magnify index libraries are created in the location specified by the magnify_root parameter configured in the WebFOCUS Administration Console. For more information, see the Magnify Security and Administration manual. ADD inserts or updates a record. Adds are influenced based on the feedtype set and require UNIQUE_KEY for update. DELETE prevents a document from being searchable. The disk space is reserved until it is reused by the index library when space is needed or when an administrator optimizes the index. The mime type attribute defines the type of content to process in the content section of the record. This value is specific to each protocol. Note: This attribute can be defined per record when more than one record is sent in a single document. Provides the information required to build the Dynamic Categorization tree. Gets concatenated with the meta tags for accessing WebFOCUS reports. Note: The URL must be encoded. The document and record-level properties are defined in the IEI Feed Agent properties tab in the iWay Designer tool and in the FORMAT MAGNIFY ENGINE SET statements. The base URL is defined by the BASE URL property in both the IEI Feed Agent and FORMAT MAGNIFY statements. 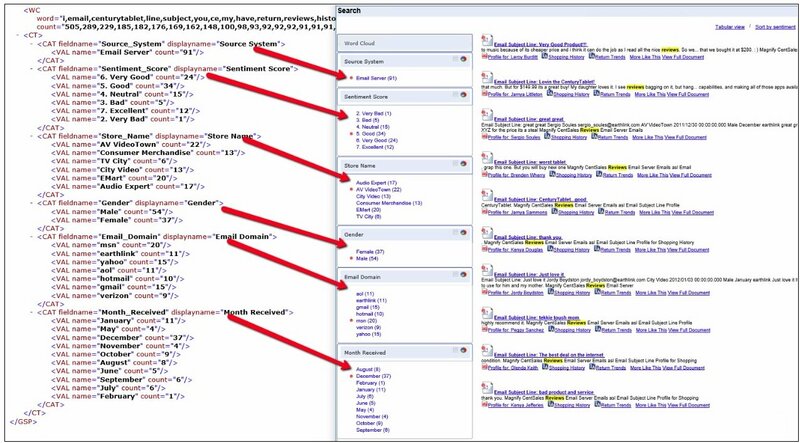 The query string parameters appended to the records URL attribute are generated by user-defined properties of the IEI Feed Agent or in the FORMAT MAGNIFY alias naming conventions. Defines the actual document being indexed with Magnify. The attribute encoding must be set to base64binary and the content assigned within this node must be base64 encoded. The content document is generated using the iWay Process Transformation described in Supporting Information for iWay or the FORMAT MAGNIFY alias naming convention. Record. Used for structured and semi-structured data. URL. Used for web-accessible files. Document. Used for embedded files. TITLE. Is the text assigned as the Search Results main link text. This can be enriched with HTML. META TAG. Is the field name and its value stored in the index with the search result. For more information on the available meta tags, see Supporting Information for iWay. BODY. Content indexed and made available for searching. Note: The BODY element is stored as IBI_CONTENT in the Magnify index library, which can be accessed using tools, such as Lucene Luke. The following image illustrates a decoded document that can be indexed using the record protocol. Note: Magnify requires base64 encoded content and an encoded record URL. The URL protocol is used for web-accessible files and is recommended for larger files. Magnify fetches the document and reads in and indexes the content. The mime type attribute of the record must be set to application/openurl. Magnify locates the file based on the URL attribute value of the record. If a URL cannot be accessed or indexed, it is logged in the application server log files. The document inserted into the content section is also an XML document with an ENCODEDDOCUMENT root element containing HEAD, DOCUMENT, and AUTHENTICATION sections. Password. Required if the file is password protected. The password is used to read the file for indexing and is optional. Mimetype. Must be set to file/auto. The document is passed to the Magnify parser to process various file types based on information found in the document header. The content element is empty, since Magnify fetches the content based on the URL attribute value of the record. The Authentication section contains the wwwauthenticateuserid and wwwauthenticatepassword attributes, which are used to access the domain where the document is located. The contents of the document indexed are stored as IBI_CONTENT in the Magnify index library which can be accessed using tools, such as Lucene Luke. The following image illustrates a decoded document that can be indexed using the URL protocol. The document protocol is used when files can be embedded into the document that is being indexed. Magnify reads in and indexes the content of the document. The mime type attribute of the record must be set to application/encodeddocument. The document inserted into the content section is an XML document with an ENCODEDDOCUMENT root element containing a HEAD and DOCUMENT section. The DOCUMENT section contains attributes about the embedded file within the Document tags. Encoding must be set to base64binary. The mime type must be set to file/auto. The fetched document is passed to the Magnify parser to process various file types based on information natively found in the document header. A password is required if the file is password protected. The password is used to read the file for indexing and is optional. The contents of the document indexed are stored as IBI_CONTENT in the Magnify index library which can be accessed using tools such as Lucene Luke. The following image illustrates a decoded document that can be indexed using the Document protocol. Embedding files into the Magnify feed document can be done using the file object in iWay Service Manager (iSM). For more information on the iWay Process Flow, see Supporting Information for iWay. The embedded file must be base64 encoded. This results in a double-encoded document prior to being sent to Magnify as part of the base64 encoding of the document within the content section. WC. Describe Word Cloud terms and their counts. CT. Describe Category Tree Fields, Items, and their respective counts. Word Cloud data is returned in a WC element that includes the count and word attributes. Each attribute contains a comma-separated list where the parallel order between count and word correlate. This means that the first word has a count of the first number listed. Category Tree data is returned in a CT element with a CAT sub-element for each Category field with attributes for the source field name (fieldname) and the text to display in the interface (displayname). Each Category field has VAL sub-elements for each of the Category values (name) and the corresponding counts (count). The following image shows an example of a Magnify XML output document, where the data identified by the CT element is used to build the Category Tree in the Magnify search results.